The Cookie Monster vocals, the evil solos, the song titles like "Inaugurating Evil" can only add up to one thing: another Satanic Swedish metal clan. 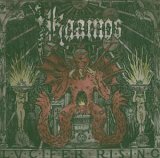 This time around, the band in question is Kaamos, whose Grave meets Entombed uproar is well versed and oh so demonic. 10-tracks of abrasive, defiant death metal with both punishing lows and memorable melodic parts, tracks like "Theriomorphic Pandaemonium" and "Chthonic" strike hard and leave welts, like any respectable death metal outfit should. If you yearn for the days when death metal was a lot less diluted, check out Kaamos. Kaada / Patton: Romances Kaisers, The: Shake Me!